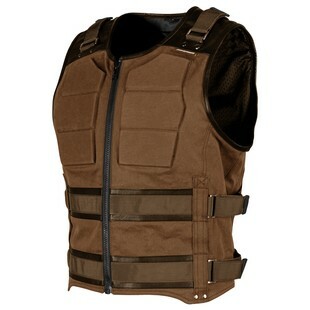 Take the gunslinging vibes of John Wayne and Jeff Bridges, and make them moto-friendly and then you have the Speed and Strength True Grit Vest. Marshall Rooster Cogburn would be proud of the rugged integrity of the True Grit Vest, with its heavy duty canvas and leather trim. The Speed and Strength True Grit Vest has a removable armed response open carry side holster in the off chance that you might need to pull a Rooster. The Speed and Strength True Grit Vest is just as tough as it sounds, and is bound to give riders better protection than the cowboys from True Grit had.